With whimsy and candor, Gimhongsok’s sculptures reward the epicure’s predilection for subtlety as well as the hedonist’s quest for pure joy. The artist’s acuity in merging conceptual rigor with an attention to form coheres the two groups of sculptures in this exhibition. In the first series, “Incomplete Order Development,” 2018, blocky, Cubist humanoid figures, most of them roughly three feet high, look as though they are balancing on their heads or standing upright, arms raised to the skies. Constructed in cement, their surfaces are pocked and spotted, vestigial indicators of their past lives as Styrofoam blocks. The nineteen sculptures on display from the series “Untitled (Short People),” 2017–, index more than one hundred of the artist’s acquaintances. 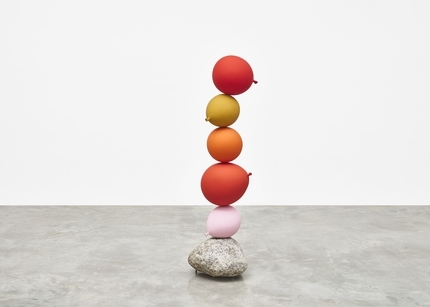 Relatives, former classmates, colleagues, and students were asked to blow up colorful balloons, which were then cast in bronze and stacked in groups of four, five, and six—an extension of the artist’s prior series “MATERIAL,” 2012, and “8 breaths (everyday monument),” 2014. (In “MATERIAL,” for instance, the artist asked several of his family members to make a wish while blowing into balloons; the resultant title is an acronym of these hopes: mother, achievement, travel, everyday wonders, rightness, interest, attraction, and love.) For “Untitled (Short People),” the balloons are produced in varying sizes and a range of colors, from lemon yellow to slate gray and metallic gold. Each stack is perched atop a stone, perhaps for textural contrast rather than stability. As abstractions of figures who have populated, impacted, and perhaps since exited the life of the artist, the sculptures function as a procession of relationships, both heavy and light, that comprise an individual life.